Greener Pastures Sanctuary is a small not for profit farm animal sanctuary located in Waroona, approximately 110kms from Perth in Western Australia's Peel region, whilst our foster animals are located all around the Perth metro and NOT in Waroona. Our 100 acres of animal bliss is a permanent and temporary home to rescued animals such as horses, cattle, goats, sheep, chickens, ducks and pigs. Gus is a handsome, domestic short hair who has been through a lot in his short life, spending 18 months out on the streets and contracting FIV he has certainly been on a wild ride but he is ready to settle down with that special someone/s! Are you male or female? Doesn’t matter, Gus swings both ways and will love you all the same. Have a family? Gus is a gentle soul and is great with kids! Gus also won’t mind if you have a dog but it’s probably best for Gus to settle down in a cat-free home. 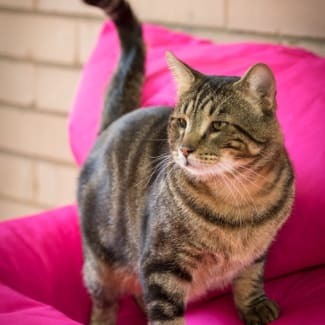 After spending most of his life on the streets Gus would prefer a home where he can spend most of his time inside relaxing and doing important cat things like sleeping and eating. If he does go outside he would prefer to only go into a cat run, Gus would feel terrible if he passed FIV onto another kitty. Gus is a big smoocher and loves hard pats, he also loves a good chat and is the perfect listener, you really can’t go wrong with him so call and arrange a date today! Gus can’t wait to meet you! Gus has had all of his vet work done including sterilization, vaccination and microchipping.